Microneedling is one of the most effective ways to improve skin texture, treat scars, fine lines and wrinkles, with minimal downtime. Using either the Dermapen or SkinPen, this state-of-the-art precision tool is designed to stimulate your skin’s natural ability to produce new collagen. 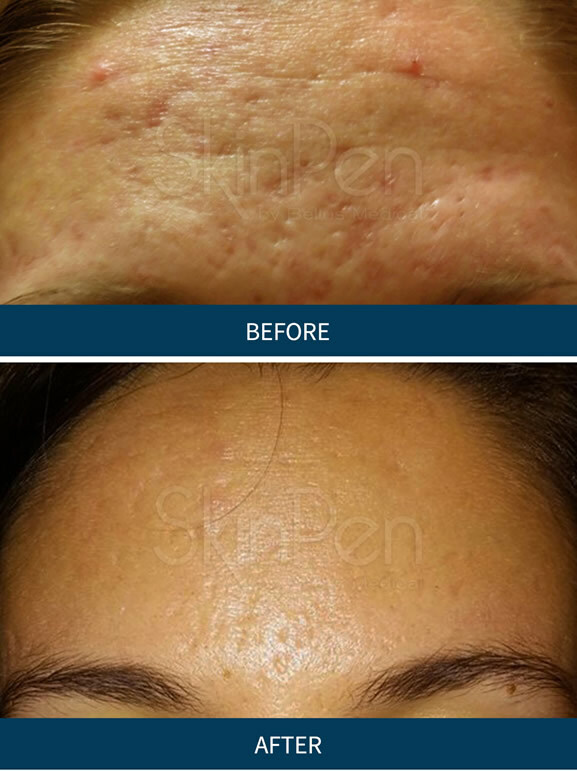 Additionally, these SkinPen Precision benefits are backed by findings in Bellus Medical's clinical trials, as well as satisfaction reported by the trial's subjects. 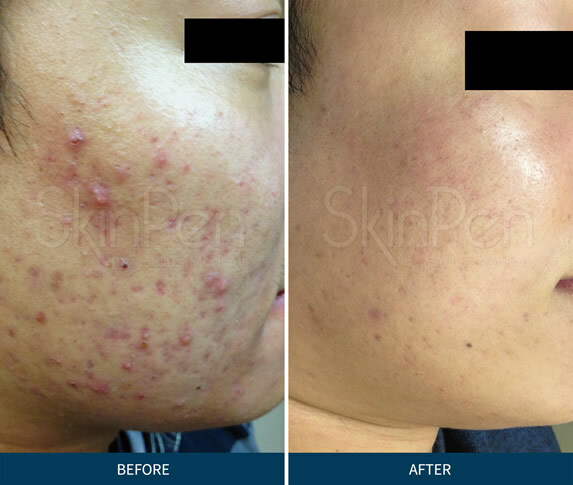 Subjects increasingly reported improvement in the appearance of their acne scars, and at the end of 6 months, 90% reported an improvement in the appearance of their acne scars. Further, 90% said they would recommend SkinPen Precision treatment. Microneedling is trending, and for good reason. Everyone is falling in love with the results! It’s clinically proven safe, minimally invasive with little to no downtime, and helps improve the appearance acne scars. The outcome is beautiful, youthful looking skin! The procedure lasts less than an hour. After applying a topical numbing cream, Dr. Cockerham slowly glides the Dermapen over the repair area as the micro-needling penetrates the areas where scars, wrinkles and elasticity problems exist. The micro penetrations cause the skin to naturally recover and rejuvenate by triggering collagen production. Micro-needling can reverse years of sun damage, address fine lines and wrinkles, skin tone, texture, acne scars, hyperpigmentation, and enhance the overall appearance of the skin. 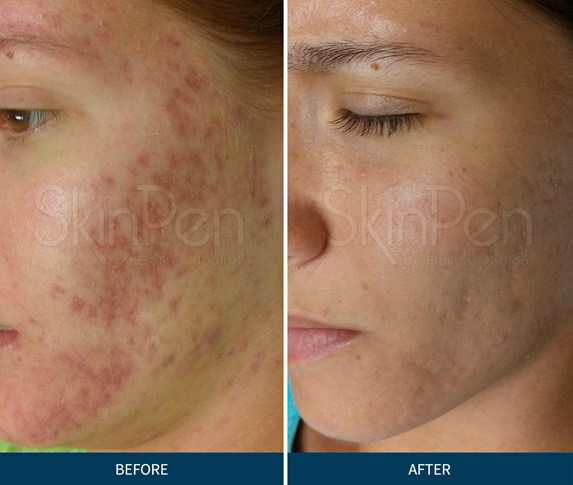 With effects comparable to CO2 treatments (ActiveFX and DeepFX), microneedling has significantly less downtime. The skin’s inflammatory reaction with micro-needling fades within hours to a pinkish hue that may last 12-24 hours. Monthly treatments are recommended for full benefit in about six months. To reduce visible redness, we recommend healing camouflage, peptides or hyaluronic acid after the procedure, and to protect the skin with physical blockbased sun screen—all available through Dr. Cockerham’s office. For more information about micro-needling, call today to schedule your personalized consultation with Dr. Cockerham. As we age, our skin color loses its fresh appearance due to changes in collagen, alterations in fat and bone loss. 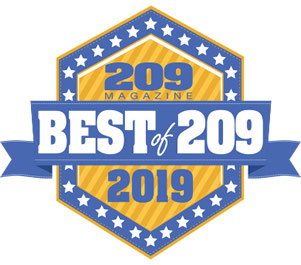 Dr. Cockerham is a member of the American Cosmetic Cellular Medicine Association and is trained in a procedure called PRP, which uses your own blood-derived growth factors to enhance your facial appearance by improving tone and texture with new collagen formation. This procedure is often used to complement the classic use of Botox®, fillers, lasers and surgery for a rejuvenated look. Dr. Cockerham uses a sterile Magellan centrifuge to isolate your platelets from your blood to derive platelet-rich plasma (PRP). The activated platelets are then injected into your face to release growth factors that enhance collagen formation, tone and texture. Your activated growth factors can be applied topically if laser and/or microneedling has been performed. The procedure can be used as a surgical adjunct to improve skin texture. The use of PRP does not add downtime to your rejuvenation process. During your consultation, Dr. Cockerham will help you choose the minimally invasive program that will best suit your needs. Topical daily non-prescriptive KCMD products are combined with prescriptives like Retin A® to prolong the effectiveness of injectables, laser and surgery. Botox® can relax dynamic lines, while Hyaluronic Acid (HA) dermal fillers, such as Restylane® or Perlane® , can be injected in a highly specialized manner to enhance the natural shape of your face. Fractionated laser treatment and/or microneedling may also be used in areas with more superficial wrinkles to improve your appearance. For more information about using your own growth factors to optimize facial appearance, schedule your personal consultation with Dr. Cockerham today.